A Shure DCS 6000 conference unit. At the Trinidad campus of the University of West Indies, the largest and longest standing higher education provider in the English-speaking Caribbean, the Caribbean Interpreting and Translation Bureau (CITB) recently selected a Shure DCS 6000 digital conference system in offering translation services in 12 different languages, as well as interpreters and audio conferencing for regional meetings. Working with political clients such as Trinidad & Tobago Bureau of Standards, Ministry of Foreign Affairs, Caribbean Agro-Economic Society, and the Ministry of Planning and Sustainable Development, CITB seeks to deliver the highest-quality audio possible during high-profile meetings. Collaborating closely with Caribbean Entertainment Technologies Ltd. (CET), a local professional audio and visual systems integration company, The Shure DCS 6000 conference system was chosen for its ease of use, service, expandability, multilingual features, and durability. The DCS 6000 combines hardware and software options to effectively and securely manage meetings with control and reliability. With a variety of touchscreen, portable, and flush mounted conference units, the system can conform to the specific needs or protocols, ideal for CITB’s various clients and university students. DCS 6000 equipment was supplied to the university for on-campus meetings and student use, while additional items were purchased to support CITB client projects. 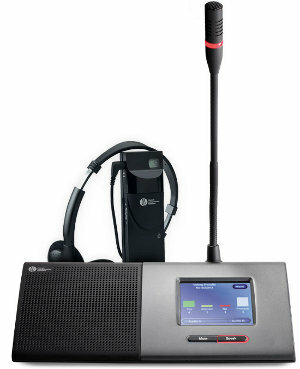 The system can accommodate simultaneous interpretation of up to 31 languages and is expandable up to 3,800 delegate units. And, it can be controlled with a tablet or PC through a web browser interface or an external room control system.